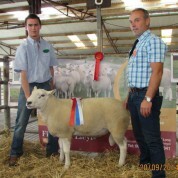 Flock 1930 & 2376 – "Quality Lleyn Sheep"
Finn Leigh Lleyn based in Co. Donegal are importers of Quality Lleyn Sheep. We have a vast collection of stock from a purebred closed flock. We pride ourselves in sourcing and delivering some of the finest stock on the island. © Copyright. Finnleigh Lleyn 2012.